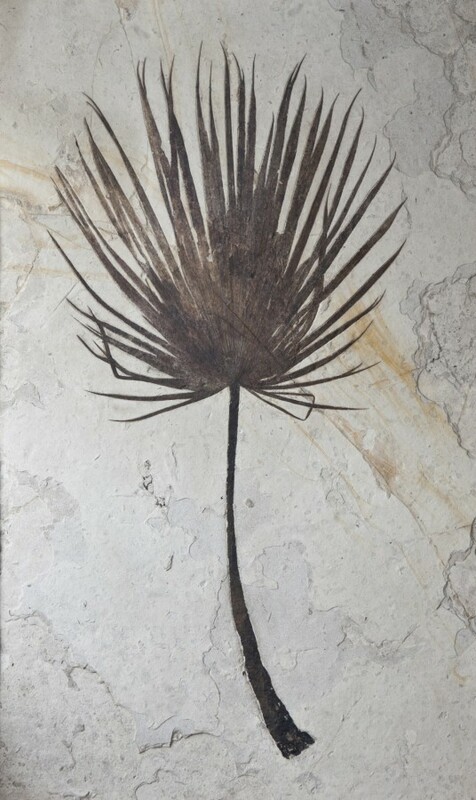 Not only the age, but the sheer size and level of detail preserved makes this palm frond one of the most impressive in our collection. The palm frond was alive around 55 million years ago, in the early Eocene period. This scale of preservation is extremely rare, and made possible due to a specific combination of conditions. 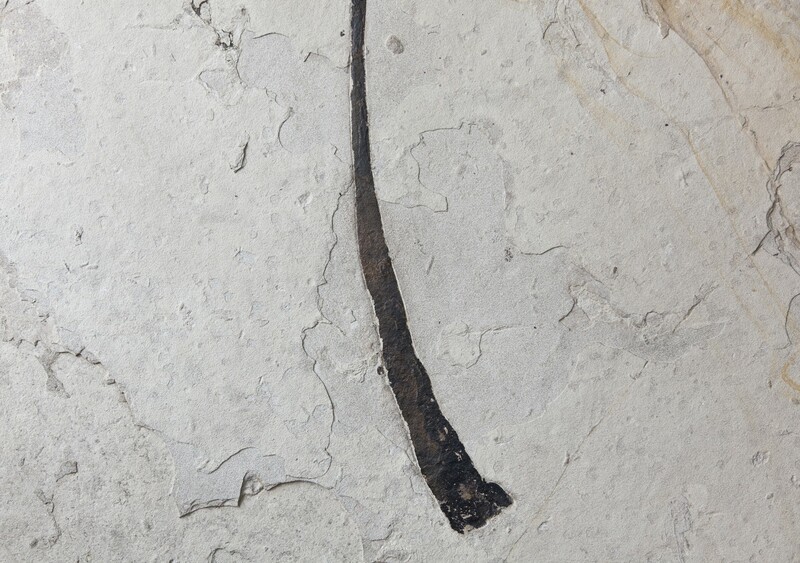 After falling from an ancient species of palm tree, this frond fell onto a giant freshwater lake named Fossil Lake in current Wyoming, USA. 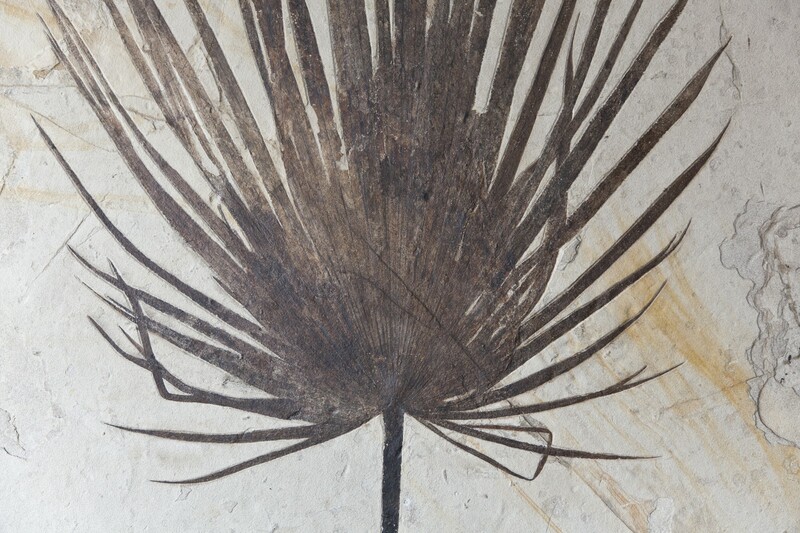 A cooling climate in North America at this time caused the palm frond to sink quickly, so that predators hardly had a chance to eat it on the way down. The size and depth of this lake ensured that almost no oxygen reached the bottom (an anoxic chemical environment). Not only did this inhibit animals from surviving there to eat the frond, but it also slowed the rate of decay of the organic matter. 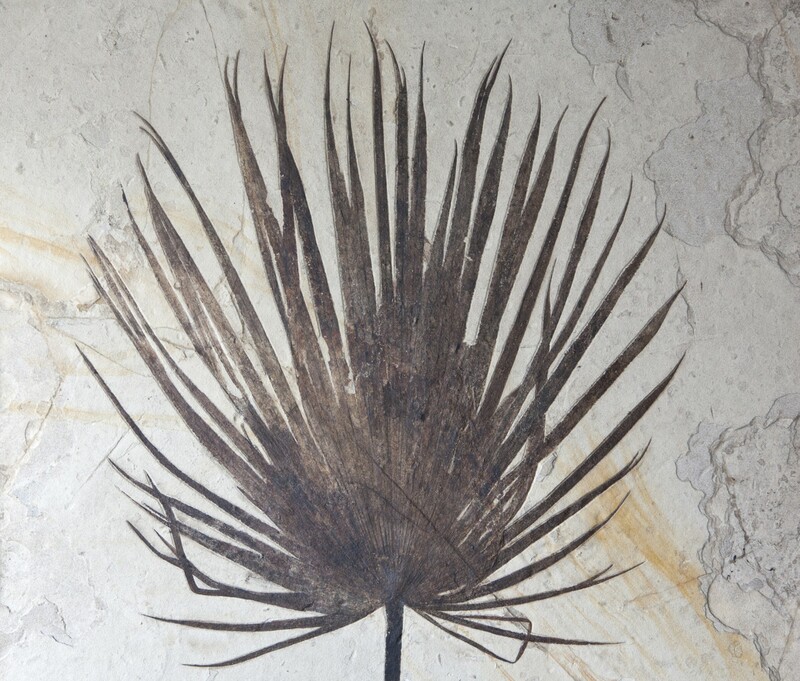 However, over time the frond would have rotted, if not for a final key condition: a high rate of sediment deposition. Fossil Lake existed whilst the Rocky Mountains of western America were being uplifted. As high land gets battered by the elements, rock fragments and dust gets transported away by rivers and the wind, causing high rates of rock erosion. Positioned between these young mountains, the rivers flowing into Fossil Lake would be full of suspended rock dust and rock fragments. On entering the lake, the water would lose energy and drop the pebbles close to the edge of the lake, while the suspended rock dust would slowly sink down causing thin layers, or laminations, at the base of the middle of the lake. The high volume of dust settling ensured that this palm front was buried very quickly. Therefore, it did not get a chance to decay (chemically or physically) for long, before it was buried away for tens millions of years. During this time, the plate was subject to high temperatures and pressures, causing the mud surrounding the fossil to be compacted (or lithified), and change colour from dark mud into the white limestone plate we see today. However, the fossil imprint remains intact, and even the veins are still clearly visible today!